August 15, 2014, one week from today, will be the 23rd anniversary of the Special Photograph of Our Lady of Guadalupe being taken in the chapel of the National Shrine of Our Sorrowful Mother in Portland, Oregon. On June 28, 2014, I submitted a letter and 7-page report to His Excellency Archbishop Alexander K. Sample of Portland in Oregon asking for his official evaluation of the photograph. Only twelve days later, on July 10, 2014, I received the response letter from the Archbishop, in which His Excellency said, "Our Lady of Guadalupe has been the source of countless graces since her appearance to St. Juan Diego in 1531. It is not surprising that a special photograph of her image could inspire greater faith and devotion to the Most Holy Mother of God. Thank you for sharing this picture." The letter was dated July 3, 2014, which was only 5 days after I submitted the letter and report to His Excellency. It was a big surprise that the response came so fast. When I opened and began reading the letter, I was briefly not sure if His Excellency was recognizing the photograph as truly miraculous or not. Reading it several times, I was convinced that His Excellency was discerning the photograph as truly coming from God and was saying that we could go ahead with propagating it to inspire greater faith and devotion to Our Lady. I was enormously encouraged and grateful. 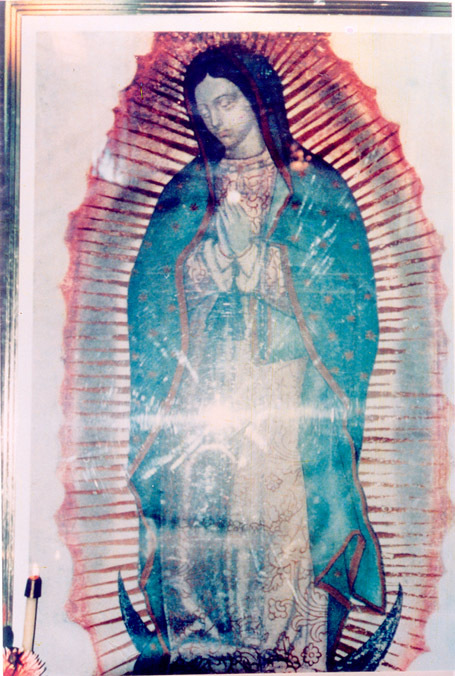 His Excellency did not use an expression like "recognizing the photograph as miraculous", because the Image of Our Lady of Guadalupe had already been approved by the local Bishop in Mexico and several Popes. St. John Paul II even visited the shrine in Mexico four times. Archbishop Sample is reminding us of the countless miracles and graces through the Image of Our Lady of Guadalupe in the past and is recognizing that this special photograph taken in Portland truly belongs to those precious miracles and graces through the Image of Our Lady of Guadalupe since 1531. Thus, the Archbishop's letter is a reason for great joy not only to the people in Oregon and the USA but to the people of Mexico and the entire Latin America and also everyone in the world who loves the Lady of Guadalupe as our true Mother and Queen. One question may arise concerning God's purpose for revealing these new images in the special photograph of Our Lady. We all know that the original Image played an enormous role in converting millions of people in Latin America to the Catholic Faith and away from the many false gods they had been worshipping for many centuries. The causes of this mass conversion were not just the amazing, miraculous nature of the Image of Our Lady on St. Juan Diego's tilma but also the realization through the Image that the God of the Lady of Guadalupe was greater than the false gods whom they had been worshipping and offering human sacrifices to and that the Lady of Guadalupe was the Mother of the true God and their own Mother who loves and protects them. Thus, the love and trust of the people in Mexico and in the entire Latin America for the Lady of Guadalupe as the Mother of true God and their Mother has become firmly established. The new images revealed in the photograph taken in Portland are the Holy Eucharist, the Holy Spirit, the Blessed Mother's Immaculate Heart, the Blessed Mother kneeling and weeping for the unborn babies, and more. These are the signs that help us realize that God's plan through the Image of Our Lady of Guadalupe has not been limited to the salvation of the Latin Americans. Through the new signs in this photograph, God reveals His Will to renew the entire world ─ spiritually and morally, in which the Holy Eucharist is firmly recognized as the resurrected Lord and worshipped and obeyed as our Savior and God; the Holy Spirit always dwells in us sustaining, guiding and sanctifying us; we love and rely on the Blessed Mother as our true Mother and find refuge in her Immaculate Heart; and we love and respect each other building a new world according to God's teachings and laws instead of our own ambitions, selfishness, pride, and hatred. Nobody should take this photograph lightly as a piece of paper, as it contains the images and messages from God Himself through Our Lady. If we respond rightly, it can change our private and family lives and the condition of the world.